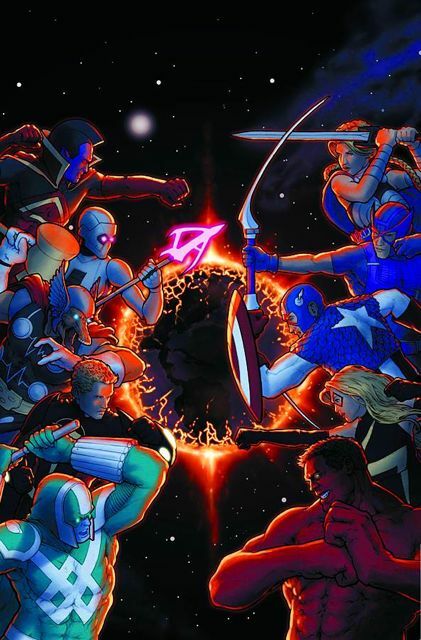 EARTH'S MIGHTIEST VERSUS THE GALAXY'S MOST MAGNIFICENT! From the fallout of ANNIHILATION and the end of the GUARDIANS OF THE GALAXY, an all-too-familiar cosmic threat has returned, this time with Earth as his beachhead. His followers span a thousand worlds, awaiting only the word to begin new wars in his name… unless the ANNIHILATORS can silence him first! So why do THE AVENGERS stand in their way, and what are the true stakes if either side fails? Plus, continuing our backup adventure, it's MOJO versus ROCKET RACCOON & GROOT onstage for a high-stakes campy cosmic free-for-all!